Chapter 95 - Department of Labor and Labor Regulations. Article 1 - Department of Labor. § 95-1. Department of Labor established. § 95-2. Election of Commissioner; term; salary; vacancy. § 95-3. Divisions of Department; Commissioner; administrative officers. § 95-4. Authority, powers and duties of Commissioner. § 95-5: Repealed by Session Laws 2015-221, s. 2.1, effective August 18, 2015. § 95-6: Repealed by Session Laws 2015-221, s. 2.2, effective August 18, 2015. § 95-7. Power of Commissioner to compel the giving of information; refusal as contempt. § 95-8. Employers required to make statistical report to Commissioner; refusal as contempt. § 95-9. Employers to post notice of laws. § 95-9.1. Notice of employer's rights during farm inspections. § 95-10. Repealed by Session Laws 1963, c. 313, s. 1. § 95-11: Repealed by Session Laws 2015-221, s. 2.4, effective August 18, 2015. § 95-12: Repealed by Session Laws 2015-221, s. 2.5, effective August 18, 2015. § 95-13. Enforcement of rules and regulations. § 95-14. Agreements with certain federal agencies for enforcement of Fair Labor Standards Act. § 95-14.1: Repealed by Session Laws 2011-145, s. 12.1, effective July 1, 2011. Article 2 - Maximum Working Hours. §§ 95-15 through 95-25. Recodified as §§ 95-25.1 to 95-25.25. Article 2A - Wage and Hour Act. § 95-25.1. Short title and legislative purpose. § 95-25.3A: Repealed by Session Laws 2003-308, s. 8, effective July 1, 2003. § 95-25.7. Payment to separated employees. § 95-25.7A. Wages in dispute. § 95-25.8. Withholding of wages. §§ 95-25.9, 95-25.10: Repealed by Session Laws 2005-453, ss. 17 and 18, effective October 1, 2005. § 95-25.11. Employers' remedies preserved. § 95-25.12. Vacation pay plans. § 95-25.13. Notification, posting, and records. § 95-25.15. Investigations and inspection of records; notice of law. § 95-25.17. Wage and Hour Division established. § 95-25.22. Recovery of unpaid wages. § 95-25.23. Violation of youth employment; civil penalty. § 95-25.23A. Violation of record-keeping requirement; civil penalty. § 95-25.23B. Civil penalty collection. § 95-25.23C. Report on youth employment enforcement activities. § 95-25.24. Restraint of violations. § 95-25.25. Construction of Article and severability. Article 3 - Various Regulations. § 95-26. Repealed by Session Laws 1971, c. 56. § 95-27. Repealed by Session Laws 1973, c. 660, s. 3. § 95-28: Repealed by Session Laws 1997-443, s. 19.14. § 95-28.1. Discrimination against any person possessing sickle cell trait or hemoglobin C trait prohibited. § 95-28.1A. Discrimination against persons based on genetic testing or genetic information prohibited. § 95-28.2. Discrimination against persons for lawful use of lawful products during nonworking hours prohibited. § 95-28.3. Leave for parent involvement in schools. § 95-29. Repealed by Session Laws 1973, c. 660, s. 4. § 95-30. Repealed by Session Laws 1971, c. 240. § 95-31. Acceptance by employer of assignment of wages. Article 4 - Conciliation Service and Mediation of Labor Disputes. § 95-32. Declaration of policy. § 95-33. Scope of Article. § 95-34. Administration of Article. § 95-35. Conciliation service established; personnel; removal; compensation. § 95-36. Powers and duties of Commissioner and conciliator. Article 4A - Voluntary Arbitration of Labor Disputes. § 95-36.1. Declaration of policy. § 95-36.2. Scope of Article. § 95-36.3. Administration of Article. § 95-36.5. Fees and expenses. § 95-36.6. Appointment of arbitrators. § 95-36.8. Enforcement of arbitration agreement and award. § 95-36.9. Stay of proceedings. Article 5 - Regulation of Employment Agencies. §§ 95-37 through 95-47. Recodified as §§ 95-47.1 to 95-47.13. Article 5A - Regulation of Private Personnel Services. § 95-47.3. Fees and contracts; filing with Commissioner. § 95-47.3A. Fee reimbursement from employers due to overstated earnings expectations. § 95-47.4. Contracts; contents; approval; tying contracts forbidden. § 95-47.7: Repealed by Session Laws 2003-308, s. 10, effective July 1, 2003. § 95-47.8: Repealed by Session Laws 2003-308, s. 11, effective July 1, 2003. § 95-47.9. Enforcement of Article; rules; hearing; penalty; criminal penalties. § 95-47.10. Power of Commissioner to seek injunction. § 95-47.11. Government employment agencies unaffected. § 95-47.12. License taxes placed upon agencies not affected. §§ 95-47.16 through 95-47.18. Reserved for future codification purposes. Article 5B - Regulation of Job Listing Services. § 95-47.21. Violation of this Article; criminal and civil penalty. § 95-47.24. Certain practices prohibited. § 95-47.25. Contracts; contents; approval. § 95-47.26. Advertising and publication. § 95-47.28. Prohibited job listings. § 95-47.29. Records of the job listing service. § 95-47.30. Administration of this Article. § 95-47.31. Review of job listing services. Article 6 - Separate Toilets for Sexes. §§ 95-48 through 95-53: Repealed by Session Laws 1993, c. 204, s. 1. Article 7 - Board of Boiler Rules and Bureau of Boiler Inspection. §§ 95-54 through 95-69.7. Repealed by Session Laws 1981 (Regular Session, 1982), c. 1187, s. 1. Article 7A - Uniform Boiler and Pressure Vessel Act. § 95-69.10. Application of Article; exemptions. § 95-69.11. Powers and duties of Commissioner. § 95-69.12. Boiler Safety Bureau established. § 95-69.13: Repealed by Session Laws 2015-221, s. 2.6, effective August 18, 2015. § 95-69.14. Rules and regulations governing the construction, operation and use of boilers and pressure vessels. § 95-69.15. Classification of inspectors; qualifications; examinations; inspector's commission. § 95-69.16. Inspection certificate required. § 95-69.17. Noncomplying devices; appeal. § 95-69.18. Operation without inspection certificate; operation not in compliance with this Article; operation after nonissuance or revocation of certificate. § 95-69.19. Violations; civil penalties; appeals. § 95-69.20. Violations; criminal penalties. § 95-69.21: Reserved for future codification purposes. § 95-69.22: Reserved for future codification purposes. § 95-69.23: Reserved for future codification purposes. § 95-69.24: Reserved for future codification purposes. § 95-69.25: Reserved for future codification purposes. § 95-69.26: Reserved for future codification purposes. § 95-69.27: Reserved for future codification purposes. § 95-69.28: Reserved for future codification purposes. § 95-69.29: Reserved for future codification purposes. Article 7B - Historical Boilers. § 95-69.30. Safety Program for Operators and Apprentices. Article 8 - Bureau of Labor for the Deaf. §§ 95-70 through 95-72: Repealed by Session Laws 1975, c. 412, s. 1. Article 9 - Earnings of Employees in Interstate Commerce. § 95-73. Collections out of State to avoid exemptions forbidden. § 95-74. Resident not to abet collection out of State. § 95-75. Remedies for violation of § 95-73 or 95-74; damages; indictment. § 95-76. Institution of foreign suit, etc., evidence of intent to violate. § 95-77. Construction of Article. Article 10 - Declaration of Policy as to Labor Organizations. § 95-78. Declaration of public policy. § 95-79. Certain agreements declared illegal. § 95-80. Membership in labor organization as condition of employment prohibited. § 95-81. Nonmembership as condition of employment prohibited. § 95-82. Payment of dues as condition of employment prohibited. § 95-83. Recovery of damages by persons denied employment. § 95-84. Application of Article. Article 11 - Minimum Wage Act. §§ 95-85 through 95-96: Repealed by Session Laws 1979, c. 839, s. 2. Article 12 - Units of Government and Labor Unions, Trade Unions, and Labor Organizations, and Public Employee Strikes. § 95-97: Repealed by Session Laws 1998-217, s. 26. § 95-98. Contracts between units of government and labor unions, trade unions or labor organizations concerning public employees declared to be illegal. § 95-98.1. Strikes by public employees prohibited. § 95-99. Penalty for violation of Article. § 95-100. No provisions of Article 10 of Chapter 95 applicable to units of government or their employees. Article 13 - Payments to or for Benefit of Labor Organizations. § 95-102. Certain payments to and agreements to pay labor organizations unlawful. § 95-103. Acceptance of such payments unlawful. Article 14 - Inspection Service Fees. § 95-105: Repealed upon adoption of rule pursuant to G.S. 95-100.5(20), effective July 1, 2003. § 95-106: Repealed upon adoption of rule pursuant to G.S. 95-100.5(20), effective July 1, 2003. § 95-107. Assessment and collection of fees; certificates of safe operation. § 95-108. Disposition of fees. § 95-109. Repealed by Session Laws 1985 (Reg. Sess., 1986), c. 990, s. 3. § 95-110. Reserved for future codification purposes. Article 14A - Elevator Safety Act of North Carolina. § 95-110.1. Short title and legislative purpose. § 95-110.4. Elevator and Amusement Device Division established. § 95-110.5. Powers and duties of Commissioner. § 95-110.6. Noncomplying devices and equipment; appeal. § 95-110.7. Operation without certificate; operation not in accordance with Article or rules and regulations; operation after refusal to issue or after revocation of certificate. § 95-110.8. Operation of unsafe device or equipment. § 95-110.10. Violations; civil penalties; appeals. § 95-110.11. Violations; criminal penalties. § 95-110.13. Authorization for similar safety and health federal-State programs. § 95-110.14. Confidentiality of trade secrets. § 95-110.15. Construction of Article and rules and regulations and severability. § 95-111. Reserved for future codification purposes. Article 14B - Amusement Device Safety Act of North Carolina. § 95-111.1. Short title and legislative purpose. § 95-111.4. Powers and duties of Commissioner. § 95-111.5. Pre-opening inspection and test; records; revocation of certificate of operation. § 95-111.6. Noncomplying devices; appeal. § 95-111.7. Operation without certificate; operation not in accordance with Article or rules and regulations; operation after refusal to issue or after revocation of certificate. § 95-111.9. Operation of unsafe device. § 95-111.13. Violations; civil penalties; appeal; criminal penalties. § 95-111.14. Denial of permission to enter amusement device. § 95-111.16. Authorization for similar safety and health federal-State programs. § 95-111.17. Confidentiality of trade secrets. § 95-111.18. Construction of Article and rules and regulations and severability. §§ 95-112 through 95-115. Reserved for future codification purposes. Article 15 - Passenger Tramway Safety. § 95-116. Declaration of policy. § 95-118. Registration required; application procedures. § 95-119. Certification criteria; procedures; display of certificate. § 95-120. Powers and duties of the Commissioner. § 95-121. Inspections and reports. § 95-124. Suspension of registration. § 95-125. Effective date of initial applications. § 95-125.1. Operation of unsafe device. § 95-125.3. Violations; civil penalties; appeal; criminal penalties.  Article 16 - Occupational Safety and Health Act of North Carolina. § 95-126. Short title and legislative purpose. § 95-129. Rights and duties of employers. § 95-130. Rights and duties of employees. § 95-131. Development and promulgation of standards; adoption of federal standards and regulations. § 95-133. Office of Director of Occupational Safety and Health; powers and duties of the Director. § 95-135. North Carolina Occupational Safety and Health Review Commission. § 95-136.1. Special emphasis inspection program. § 95-137. Issuance of citations. § 95-140. Procedures to counteract imminent dangers. § 95-142. Legal representation of the Department of Labor. § 95-143. Record keeping and reporting. § 95-145. Reports to the Secretary. § 95-146. Continuation and effectiveness of this Article. § 95-147. Training and employee education. § 95-148. Safety and health programs of State agencies and local governments. § 95-149. Authority to enter into contracts with other State agencies and subdivisions of government. § 95-150. Assurance of adequate funds to enforce Article. § 95-152. Confidentiality of trade secrets. § 95-153. Reserved for future codification purposes. § 95-154. Authorization for similar safety and health federal-state programs. § 95-155. Construction of Article and severability. § 95-156. Handling of dangerous antineoplastic agents. § 95-157. Carolina Star Program. § 95-158: Reserved for future codification purposes. § 95-159: Reserved for future codification purposes. § 95-160: Reserved for future codification purposes. Article 17 - The Uniform Wage Payment Law of North Carolina. §§ 95-161 through 95-172. Repealed by Session Laws 1979, c. 839, s. 2. Article 18 - Identification of Toxic or Hazardous Substances. §§ 95-175 through 95-190. Reserved for future codification purposes. § 95-191. Hazardous Substance List. § 95-192. Safety data sheets. § 95-195. Complaints, investigations, penalties. § 95-197. Withholding hazardous substance trade secret information. § 95-198. Medical emergency and nonemergency situations. §§ 95-199 through 95-207. Reserved for future codification purposes. § 95-208. Community information on hazardous chemicals. §§ 95-209 through 95-215. Reserved for future codification purposes. § 95-217. Preemption of local regulations. § 95-219. Reserved for future codification purposes. § 95-220. Reserved for future codification purposes. § 95-221. Reserved for future codification purposes. Article 19 - Migrant Housing Act of North Carolina. § 95-222. Short title; legislative purpose. § 95-224. Scope; powers and duties. § 95-225. Adoption of standards and interpretations. § 95-226. Application for inspection. § 95-228. Waiver of rights. § 95-229. Construction of Article; severability. § 95-229.1. Actions upon finding uninhabitable migrant housing. § 95-229.2. Reserved for future codification purposes. § 95-229.3. Reserved for future codification purposes. § 95-229.4. Reserved for future codification purposes. Article 19A - Overhead High-Voltage Line Safety Act. § 95-229.10. Precautionary safety arrangements. Article 20 - Controlled Substance Examination Regulation. § 95-232. Procedural requirements for the administration of controlled substance examinations. § 95-233. No duty to examine. § 95-234. Violation of controlled substance examination regulations; civil penalty. § 95-235. Certain federal agencies exempted. §§ 95-236 through 95-239. Reserved for future codification purposes. Article 21 - Retaliatory Employment Discrimination. § 95-242. Complaint; investigation; conciliation. § 95-244. Effect of Article on other rights. §§ 95-246 through 95-249. Reserved for future codification purposes. Article 22 - Safety and Health Programs and Committees. § 95-251. Safety and health programs. § 95-252. Safety and health committees required. § 95-257: Reserved for future codification purposes. § 95-258: Reserved for future codification purposes. § 95-259: Reserved for future codification purposes. Article 23 - Workplace Violence Prevention. § 95-261. Civil no-contact orders; persons protected. § 95-262. Commencement of action; venue. § 95-263. Process for action for no-contact order. § 95-264. Civil no-contact order; remedy. § 95-265. Temporary civil no-contact order; court holidays and evenings. § 95-266. Permanent civil no-contact order. § 95-267. Duration; extension of orders. § 95-268. Notice of orders. § 95-269. Violation of valid order. § 95-270. Employment discrimination unlawful. § 95-271. Scope of Article; other remedies available.